Wow! That week went quickly! It always does when I am scrambling to get ready to go to Convention! I leave on Monday, so there's swap cards and roomie gifts to make, regular blog posts to do, plus posts for when I am away to do ahead of time. (Don't worry, I'll share some of the fun we'll be having in Salt Lake City!) 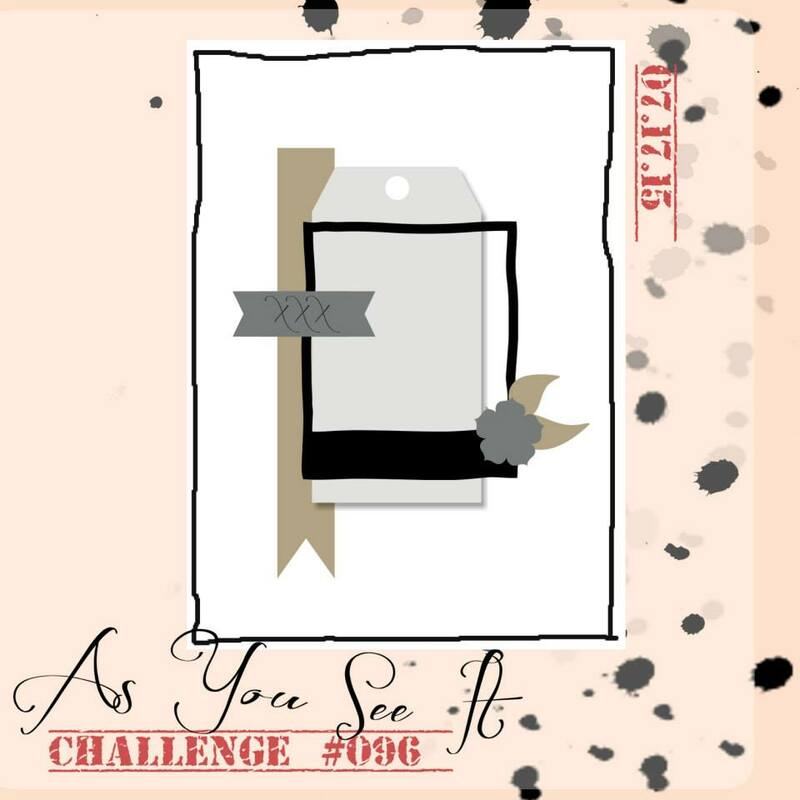 Friday means As You See It Challenges again and I absolutely LOVE Amanda's sketch this time! So many great elements! You've got to try it! It seemed perfect for the Awesomely Artistic stamp set again. 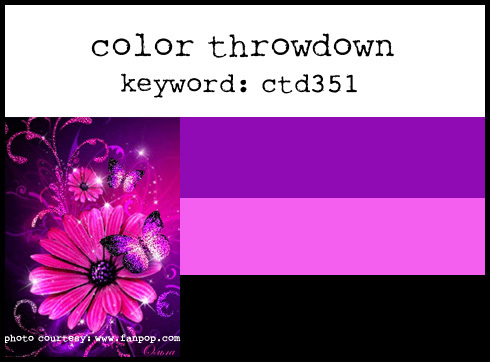 I decided to try the color swatch from Colour Throwdown this week, even though it seemed too bold at first for this sketch. But as I looked at it more, I knew I could tone down the colour intensity a bit and play up the softness and sparkle. Did I succeed? 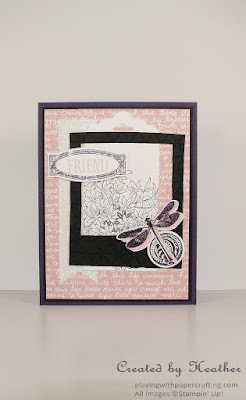 Though the card base looks black here, it is actually Elegant Eggplant with a layer of Basic Black on top of it. Instead of intense Melon Mambo, which ended up looking red beside the Eggplant, I used Blushing Bride, which toned things down considerable! The background Designer Series Paper is from the Subtles Collection Designer Series Paper Stacks. Love that script! 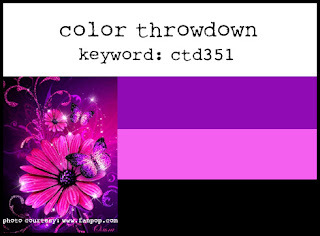 Part of the colour challenge at Colour Throwdown this week is to add some sparkle and I was quite happy to comply! A banner of Dazzling Diamonds Glimmer Paper, flagged with the Triple Banner Punch adds part of the sparkle and I also embossed the dragonfly and the "button" in the bottom right with Iridescent Ice Stampin' Emboss Powder, to add some more! The polaroid film frame would have been so easy to do with my On Film Framelits, but since they just retired, I do not have them anymore. I made to with a rectangle of Basic Black cardstock and used one of my Square Framelits to cut out the opening. 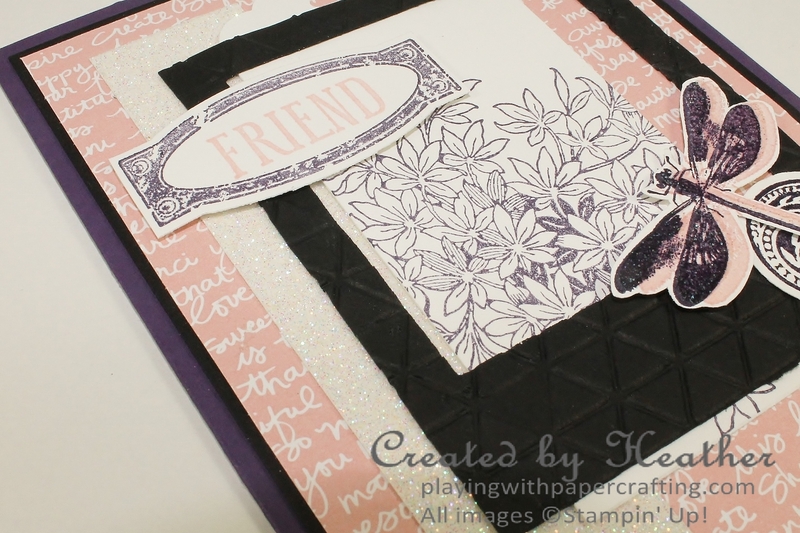 I then embossed the shape with the Tiny Triangles Embossing Folder to add some texture. I stamped the dragonfly twice, once in Elegant Eggplant and once more, offset slightly, in Blushing Bride. I stamped a third time in VersaMark, not worrying whether or not it was spot on, because it would catch one set of wings or another! I added Iridescent Ice Stampin' Emboss Powder and heat set it with the Heat Tool, before hand snipping around the images. I love the way it turned out. The Whisper White tag was a 2" wide piece of Whisper White punched with the Scalloped Tag Topper Punch. 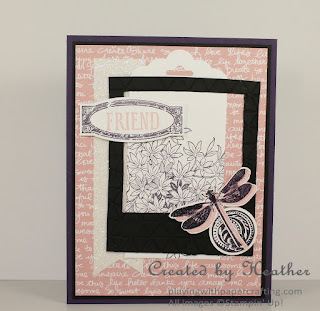 The image is from Awesomely Artistic, inked in Elegant Eggplant and stamped off once. 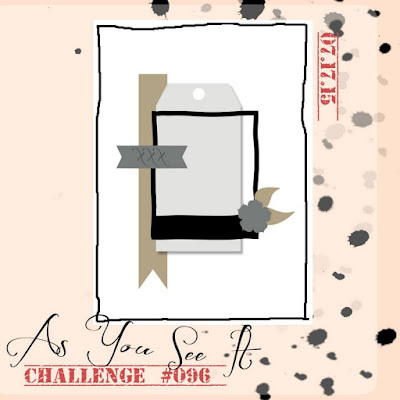 The sentiment and it's frame are from Awesomely Artistic as well and the frame can be die cut with a framelit from the Project Life Cards &Labels Framelits. I'm heading off early, early Monday morning for Salt Lake City, but I'll be in touch through email, facebook and my blog! Have a great weekend!